Close up of a California poppy. Photo © Mandy Salm. 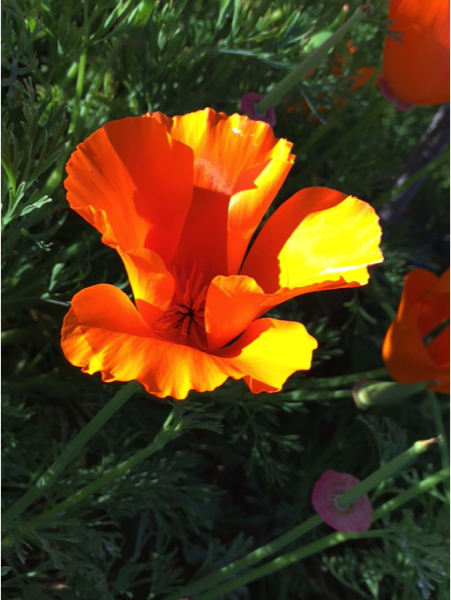 Springtime means my favorite flower, the simple but abundant and beautiful Eschscholzia californica or California poppy is in full, glorious bloom. Belonging to the papaveraceae family, this flowering plant is native to the US and Mexico and can be found growing from southern Washington down to Baja. Usually considered an annual, there is often a second bloom in autumn. The flower loves open, grassy areas such as the arid grasslands of California's intermontane valleys or seaside meadows. In proper conditions it can be grown as a perennial, developing a deep-rooted, thick orange taproot (which the gophers in my yard find rather tasty). These easy-going, drought tolerant plants sport soft fern-like blue-green foliage and four satiny petals that seem to glow from bright yellow-orange to deep orange. They mature in 55-75 days from seed to flower and favor full sun, poor soil (especially sandy soil) and offer good ground cover when mature. They perform well on slopes providing erosion control. If left to dry and re-seed, the capsules containing 60-100 or more seeds each will disperse themselves by catapulting out of the slender pod up to six feet from the plant. Poppies do not transplant well, nor do they make for good cut flowers, wilting quickly once cut, but they do produce abundant pollen and draw in bumble, honey, sweat and mining bees to pollinate. 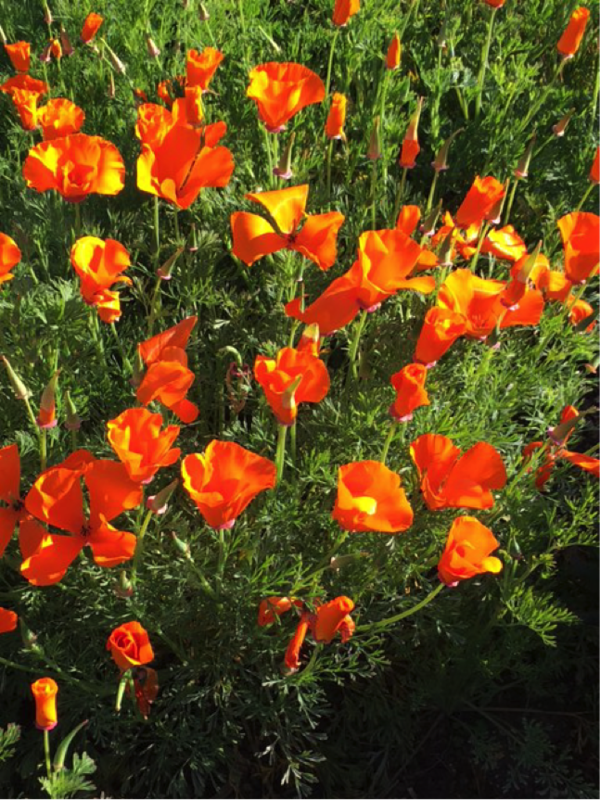 This lovely ornamental and medicinal plant became the California state flower in 1903 and is one of eleven species of the Eschscholzia genus naturally occurring in the western US. Growing to 4”-12” tall and 6”-12” wide, they bloom most heavily from March-May. Thrips, aphids and leafhoppers can feed on the sap of the plants and Lepidopteran larvae may feed on the leaves and flowers. Diseases include powdery mildew and gray mold, usually occurring from lack of air circulation and too much humidity. California poppy meadow. Photo © Mandy Salm. Very nice post, especially like the wildflower viewing locations.